Order Wholesale Hand Towels for Less Than Two Quarters a Piece! Is it really possible to get wholesale hand towels for less than 47 cents each for your spa or salon? It is when you shop with Towel Super Center! As you order greater quantities, your per-towel price nosedives, leaving you with more money in your pocket and the best quality white hand towels available for your needs. 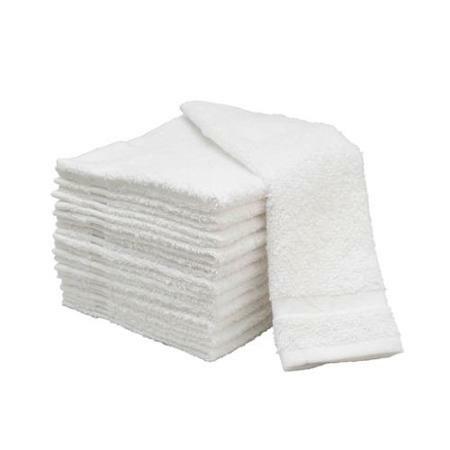 Get hand towels, fingertip towels, bath towels and more shipped right to your establishment. Are you looking for 15" by 25" white hand towels that offer uniformity and long-lasting performance? Our towels are perfectly manufactured to meet your highest standards. Not only do they make a great impression on your clients, but your employees will appreciate their durability. What makes a Towel Super Center wholesale hand towel so appealing? Absorbency. Each white hand towel is made from thirsty cotton fibers. When they come in contact with moisture, they wick it up rapidly. This leaves you with a super-absorbent towel that promises outstanding results. Softness. Your clientele expects to be pampered at your salon or spa, so don't disappoint them. Our towels provide a soft touch that works even for people with sensitive skin types. Consistent Washability. Have you had other white hand towels fade or turn gray on you? These towels are made to stay bright. With regular washing with your favorite laundry detergent, they should remain pristine wash after wash. Odor Blocking. Cotton naturally resists holding on to any unpleasant odors, which is exactly why so many spas prefer it. You can help the odor blockers by always pre-treating stains and washing your hand towels as soon as they become soiled. Great Looks. Who says that a hand towel can't be good looking? You'll love the way that our hand towels have been properly stitched to hold up and resist fraying. No one wants to see a towel that's falling apart, especially your patrons! What's one of the best aspects of having wholesale cotton towels at your business? How easy they are to launder! For best results, always wash them with like-colors in a bleach alternative product that won't break down the sturdy, fluffy fibers. Want softer towels fresh from the dryer? Add dryer balls to reduce static electricity and keep the cotton looking amazing. Looking for other towels beyond white hand towels for your spa or salon? You've come to the right place! Not only do we have wholesale white hand towels, but we also offer a plethora of other towel sizes, shapes and even colors. Plus, we have bleach-resistant colorful towels in plenty of sizes. They'll keep their vibrant hues even when exposed to common chemicals such as astringents and hair dyes. Let us help you stretch your budget for towels. Order as many dozen white hand towels as you need to keep your linen closet stocked up.